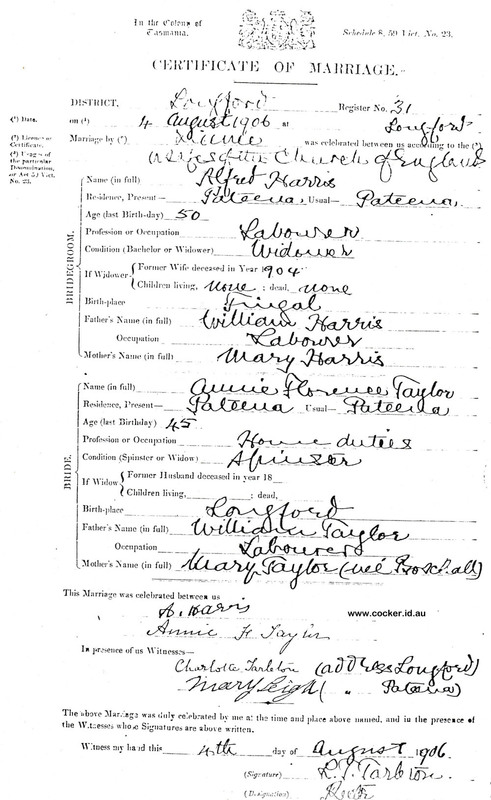 According to the details he provided on the certificate (below) when he married Annie Taylor in 1906, Alfred Harris was born in 1855 in Fingal, Tasmania, to William and Mary Harris. 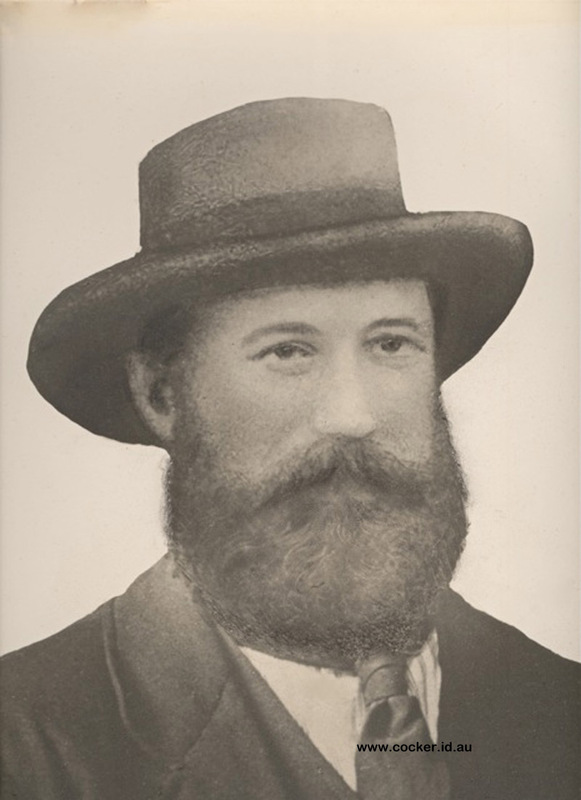 In fact, he was born in Hobart on 3 Jul 1855 to William and Ann Harris nee McCoy, but his next brother and sister were born at Avoca in the registration district of Fingal. Alfred died by the side of the road on Longford on 13 Aug 1918 at age 68, and was buried in Christ Church Cemetery, Longford, Tasmania, B14. He was thrown from a cart when carrying firewood. When the horses returned home without him his family went searching and found him deceased. He was know for riding his cart while standing and this was probably his undoing. 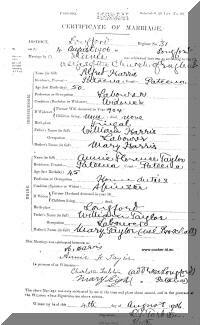 Alfred married Emma Jane Lucas, daughter of convict William Lucas and Ann Hutchins, on 25 Dec 1875 in Christ Church Anglican, Illawarra Road, Longford. Emma was born in 1857 in Bishopsbourne, Tasmania and died on 6 Jun 1904 in Devonport at age 47. He was aged 20 and Emma just 18. They had one daughter before they separated and Emma went on to have relationships with four other men. 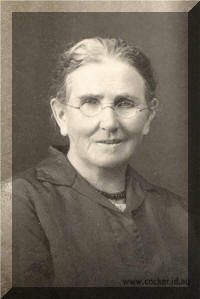 Alfred next had a life-long relationship with Annie Florence Taylor, daughter of William John Taylor and Mary Boxhall, but he was not able to marry her until 4 Aug 1906 in Longford, after his first wife, Emma Jane, died in 1904. 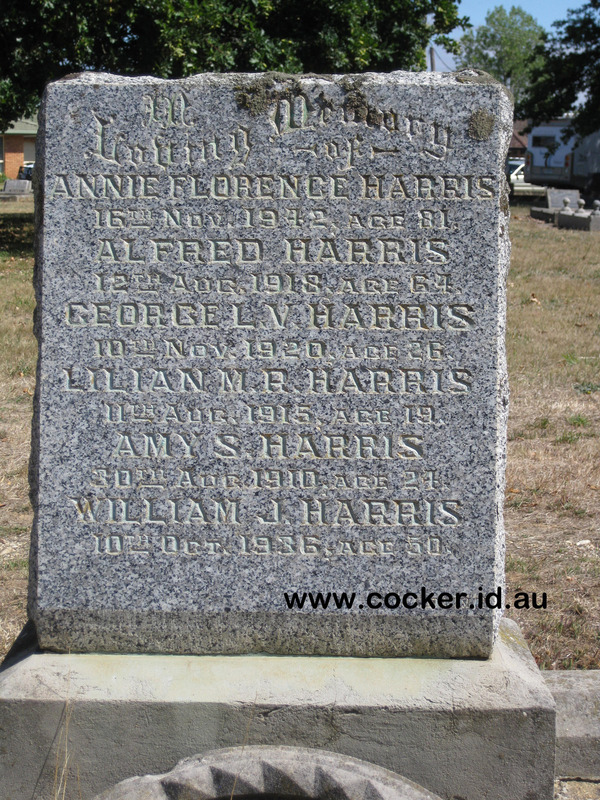 Annie was born on 30 Jul 1861 in Longford, Tasmania, died on 16 Nov 1942 in home, 140 Bathurst St, Launceston, Tasmania at age 81, and was buried in Longford Christ Church, Anglican Cemetery. The funeral of the late Mrs. Alfred Harris took place at Christ Church cemetery, Longford, on Friday afternoon, and was well attended. In the absence of the Rev. L. T. Tarleton, who was away in Hobart, the burial service was conducted by Canon Finnis of Cressy. A number of beautiful wreaths were sent by sympathising friends. The sons of the deceased acted as chief mourners. 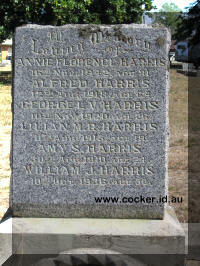 The late Mr. Harris was a son of Mr. William Harris of Pateena. He was born there and spent the whole of his life in that place. 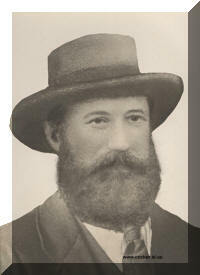 He married a daughter of the late Mr. William Taylor, of Longford. He was well known throughout the district.